5/29/2008Share this story on Facebook! 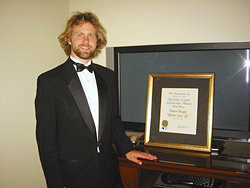 Travis Knapp '07 poses with his BMI award. Recognizing the best and brightest young songwriters between the ages of 15 and 24, the Lennon scholarships were established by Yoko Ono in conjunction with the BMI Foundation and matched by donations from Gibson Musical Instruments. Judges of this year's contest included Fergie of the Black Eyed Peas, John Legend, The Veronicas, Natasha Bedingfield, Bob Weir, and many other established musicians. "When you send something in for a contest like this, you of course imagine what it would be like to win, but you only expect to in a very protected corner of your mind," says Knapp. "It was an enormous honor which the people around me continue to remind me of. Also, it's priceless to know that folks 'in the business' like some of the work I've done. That's a huge encouragement." Knapp studied music and anthropology at Ithaca College. He also performed with the student-led, men's a cappella group, Ithacappella, and credits the group for recording the version of "Before You Go" he sent to BMI. Knapp has also played piano for 18 years and often performs in lounges and restaurants. Of his plans for the future, Knapp says, "I hope to continue writing and performing music, but I'm not going to put aside my intentions to go to massage/healing school. So we'll see if those things can happen fruitfully side by side."